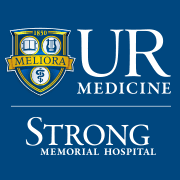 The Medical Center has a ramp garage located near Golisano Children’s Hospital and Wilmot Cancer Center, and is open for parking 24 hours a day, 7 days per week. We offer hourly, daily, and weekly parking rates. Entrance to the garage is from Thomas Jackson Drive off Elmwood Avenue or from East Drive between Elmwood Avenue and Crittenden Blvd. To navigate the garage please click on this illustration. Each area of the garage is denoted by a specific series of letters, and special signs are posted in nearby staircases and elevators to help guests note where they parked their car. The blue ramp is accessed by the hospital’s main loop on Thomas Jackson Drive. Enter the hospital grounds from Elmwood Avenue. The emergency entrance is on 601 Elmwood Avenue. If you are driving yourself, see our ED parking attendant prior to parking yourself. The Emergency Department lot is reserved for patients who drive themselves only. Patients can be dropped off at the door (do not go to the ambulance bay) and patrons may park in the hospital garage. For the first time, the Valet service will accept credit cards. Customers can pay with cash or a card, and the $8 price remains the same. Instead of worrying about payment when they pull up, drivers can leave their car with the valet and pay later, helping patients get to appointments on time. Wilmot Cancer Center, Crittenden Blvd. After 8 p.m. speak with an Ambassador, or use the valet phone in the hospital’s main lobby. The Saunders Visitor Lot is located on Crittenden Blvd. across from Strong Memorial Health & Wellness. Turn into the Saunders Research Building circle to enter this lot. For faster service these “in lane” Exit Stations can accept validation tickets or credit cards. Our attendants accept cash and credit card (Discover, MasterCard, or Visa). Take your ticket with you when entering the hospital. Visitors who misplace their parking ticket will be charged the maximum daily rate of $6.00. Obtain a day pass at the parking booth exit if you will be returning on the same day. Day pass valid for 24 hours, from the entry time stamp on receipt. Multiple-day from 1-7 day parking passes can be purchased for $6 per day. Pass must be purchased prior to exiting the visitor parking areas. Passes may be purchased at the Hospital Garage Visitor Parking Office. Validation tickets may be purchased (minimum of 3 and maximum of 10) at any of the Hospital Garage Visitor Parking Office or Parking Management Center (70 Goler House). The cost per ticket is $4.50. They are good for one exit up to $6.00. Tickets do not expire. Bone Marrow Transplant patients and parents of pediatric patients may purchase double the maximum number of validation tickets at a special rate upon presentation of SMH admission paperwork to the Cashier’s Office only. Thirty-day passes are available to immediate family members who are visiting an inpatient who has been admitted at least 30 consecutive days. A letter from a social worker is required. Please speak with the social worker on the unit the patient is located. Present letter to the Cashier’s Office or the Hospital Garage Visitor Parking office to purchase a pass.